I don't follow so-called celebrities on Twitter but, luckily, I know people who do and I rely on those good people to point out their solecisms. Here's a good one from @annfirth. 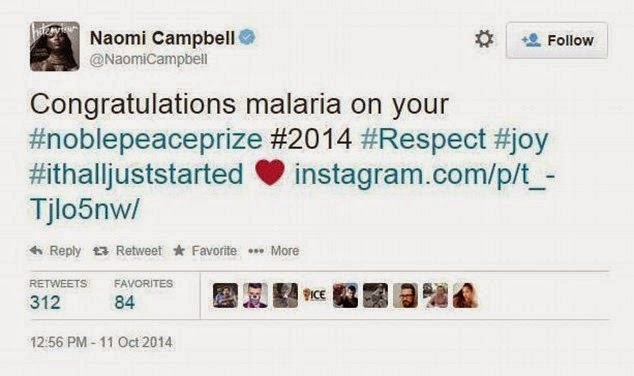 It's Naomi Campbell attempting to congratulate the fabulous Malala Yousafzai on winning the Nobel Peace Prize last week. And failing miserably. Close, Naomi, but no cigar. Not even a tobacco leaf. Even more astounding was her attempt to explain her errors on Instagram. Not good enough, Nomes. Probably best to stick to whatever it is you do. And keep well away from writing.